Many years ago now (at least 7 years ago, maybe more), I participated in one of my very first craft shows. If I remember correctly, it was a local show in the Kansas City area when my husband and I lived there for a while. I had created a lot of crafts over the years for myself and others, but just recently started to make items through traditional feltmaking for a profit. I hadn't sold my items in public much before and had recently started selling on Etsy with moderate success. I am ashamed to admit that I can't remember the name of the photographer in the booth next to mine, but she was a very nice, young woman - there with her dad helping her unpack and set up, unwrapping each photo one at a time to display. She had a lot of photos of local sites like the Plaza light display at Christmas time and Kauffman Stadium. My husband and I chatted with her off and on and purchased a few small local attraction photos including a Plaza print. We had to be careful not to spend all of our craft sales earnings for the day, but honestly, we usually did and then some when we attended shows - way too many great artists concentrated in one place not to be tempted. At the end of the show, I was very touched when the young photographer gave me the little sheep photo above already in a beautiful silver frame. It was larger, prettier and more expensive than the few 4x6 black and white photos we purchased from her. I was surprised and honored that she'd hand it over so freely. She hadn't sold much that day, and I could tell it was a bit disappointing to her. Yet, the same way she unpacked everything so carefully, she packed up everything again for another show on another day. I never saw her again. 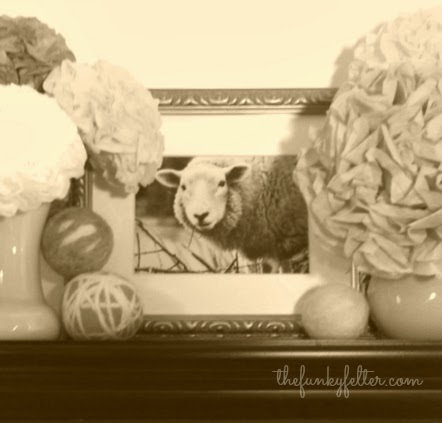 I have carried the little framed sheep through a few big moves and shuffled it from wall to shelf and occasionally tucked away in a closet, but I always remember the kindness from a fellow artist that surrounds it. The encouragement that it embodies. The photo is more about remembering where I came from and who I am today because of it rather than the framed sheep itself. Today, I don't remember her name or even her face anymore, just her youthfulness and hopefulness about what she loved to do. I also remember the meaning and the feeling of encouragement that is imprinted on the framed photo. Other than craft supplies, I'm not much of a hoarder of material or deeply sentimental things. There are, however, exceptions - like my sheep. Do have an object that embodies a feeling for you? Or an encouragement in the form of something tangible?